Fall Planted Whitetail Clover Green-up! 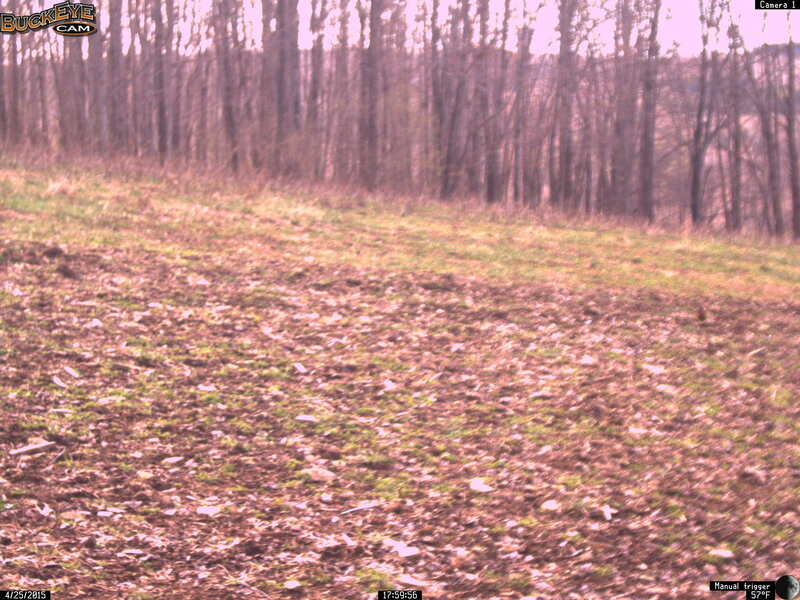 We planted Whitetail Institute, Whitetail Clover last fall right in front of our camera. 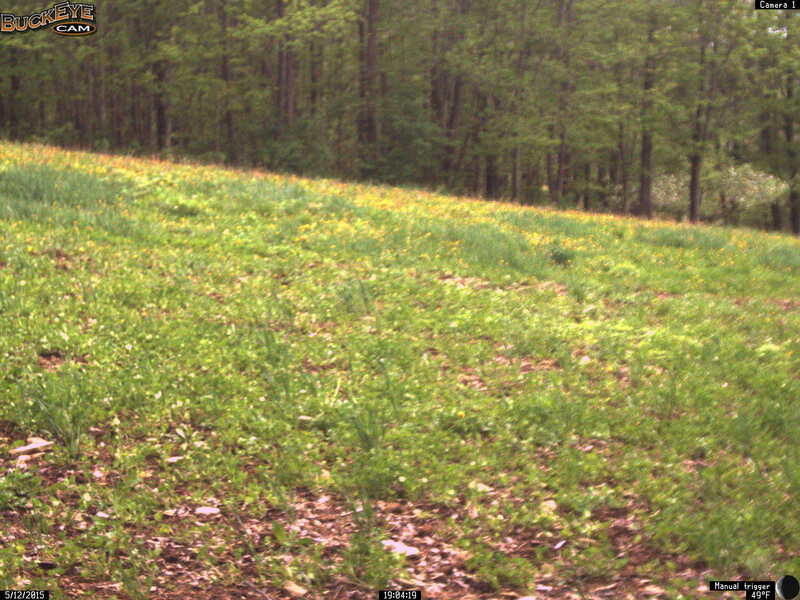 Whitetail Clover is a great source of protein for deer of all ages, and is available to the deer from spring green-up until late November in western New York State. The deer will paw through the snow to get to it even in late November, December and sometimes January. Although it was a very cold winter in western NY in the winter of 2014/2015, there was a great deal of snow accumulation for most of the winter. A blanket of snow will help protect the clover during the coldest temperatures, however we have not had any past problems with overwintering Whitetail Clover. We will write another post showing the change in body condition of the deer since they have been able to feed on green plant material this spring. Deer are browsers and will eat a variety of plants as they travel through the day and night in their 24 hour routine. For many years we have provided available plantings of whitetail clover for the deer. We believe the whitetail clover has contributed to the improvement of the overall health of the deer herd this spring and will continue to do so throughout the remainder of this year and years to come. Our perennial plantings have been lasting for 4 to 5 years before requiring re-planting. Landscape Fabric Weed Control! We are achieving very good weed control using the landscape fabric for weed control. We installed the landscape fabric about 50 days ago and so far it is doing the job. The fabric we are using was chosen based on several criteria, including price, dimensions, light and rain penetration, durability, and ease of handling. We purchased one roll from Costco for about $30.00 with dimensions of 4′ X 200′ giving us 800 sq. ft. to work with. This seemed to be less expensive than other fabrics of similar dimensions that we evaluated, although it is thinner than some. This fabric allows both light and water to penetrate the surface. It is easy to cut with a pair of simple kitchen scissors, but is quite durable in resisting punctures, and tears. We walk on it regularly. I would estimate that it provides about 75% shade, which still allows enough direct sunlight for weed seed germination underneath the fabric. The weeds that germinated underneath have been unable to penetrate the fabric, with the exception of yellow and probably purple nutsedge. We have yellow nutsedge. If nutsedge appears anywhere in our lawn or garden, we pull it immediately. The nutsedge will pull through the fabric with minimal damage, if any, to the fabric. It is our intention to re-use the fabric as long as we can, as we reconfigure the garden from season to season and year to year. We can foresee layering new fabric over old fabric. The fabric is held down by landscape staples which are about 1 1/2 inches wide and 6 inches long. These can be a little bit pricy purchased in small packages, but the cost per stable can be reduced greatly if purchased in larger quantities from a supplier that sells to commercial landscapers. You will use more of them than you might first estimate. We do walk on the fabric, however it is important that you do not walk on it so close to the root zone that you compact the soil, especially when the soil underneath is wet or very moist. When you walk on the fabric you still need to do so when the soil is dry or limit your travel to narrow pathways like you would if the fabric was not there. You can place flat stones or flat bricks to make a stepping stone pathway which can also be used to hold the fabric in place. Tags: Landscape Fabric Weed Control! 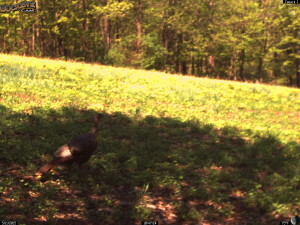 Turkey Visiting the Newly Planted Clover! It was a long hard winter in western New York State in 2014/2015. We wondered how well the wild turkeys would survive? This one looks very healthy. We talked with a couple turkey hunters last week and they had seen turkeys every day they hunted, but so far had not bagged a bird. For most hunters just being in the woods makes the hunting trip an enjoyable experience. Our turkey is visiting a field which contains both an established clover planting in the background and a fall 2014 clover planting in the foreground. We plant Imperial Whitetail Clover. 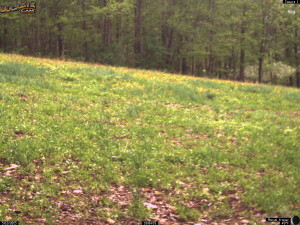 Turkeys are attracted to clover which makes it a good food plot for both turkeys and white tail deer. 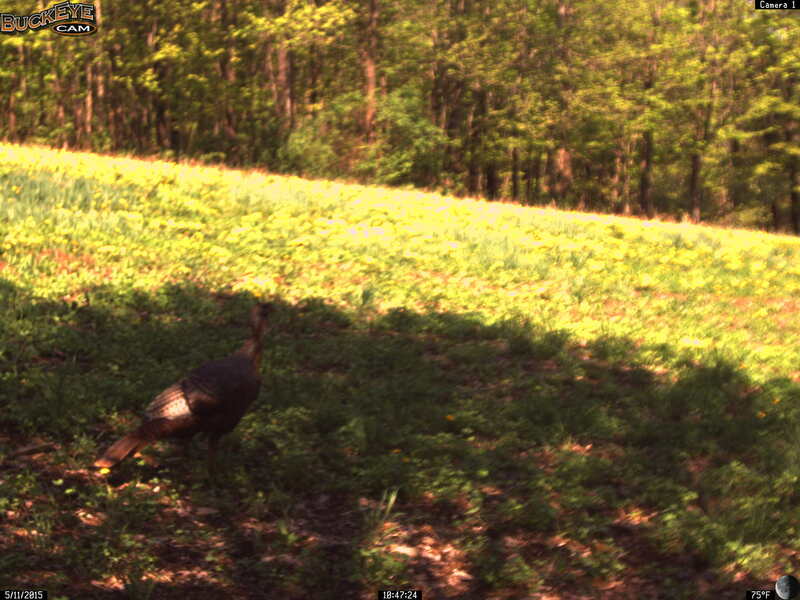 Turkey Visits the New Clover Planting! Installing the Tomato Wall! We are trying something new this year; “The Tomato Wall”. Necessity is the mother of invention and that was the inspiration for the tomato wall. 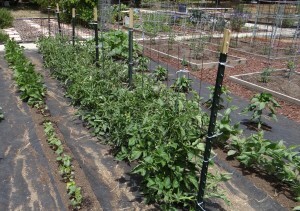 We needed tomato cages, but what we had was a limited amount of “sheets” of 4′ X 8′ concrete reinforcing wire. 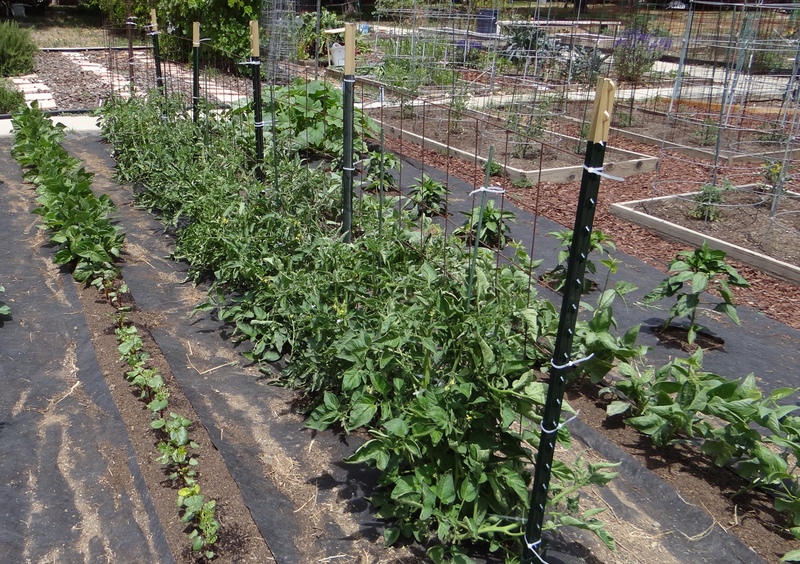 It occurred to us that later in the summer when our tomato vines got too tall for our tomato cages, that we started weaving them in and out of the tomato cages to extend support for my wandering tomato vines. What we hope will happen is that as the vines get longer, we can train them in and out of the 6 X 6 wire squares horizontally. It will take a little effort a couple times a week to train the vines, but hopefully we can do this at the same time we are picking the tomatoes. We used 5′ steel “T” posts to support the wire sheets and zip ties to secure the wire to the posts. 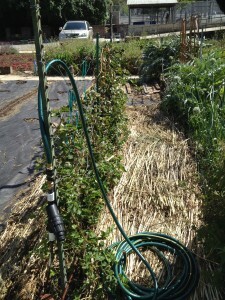 We are also using zip ties to secure the vines to the wire. When purchasing the “T” posts we had a choice between a much lighter thinner steel post, but the price difference was only about 13%, so we opted to buy the much heavier, longer lasting steel “T” posts. Managing Garden Space! 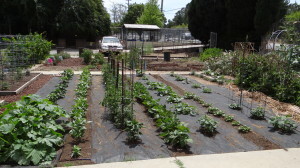 There is a lot going on in our garden and we are trying to utilize as much space as we can. On the west side of our garden we have are utilizing this space for perennials, mainly because the half row of blackberries were already established there when rented our garden. On either side of the blackberries we have used the remains of all the weeds that we initially cleared, as combination mulch and light barrier. Underneath this mulch is a layer of landscape fabric and an established carpet of bermudagrass. We are hoping this barrier will eventually control the underlying bermudagrass. 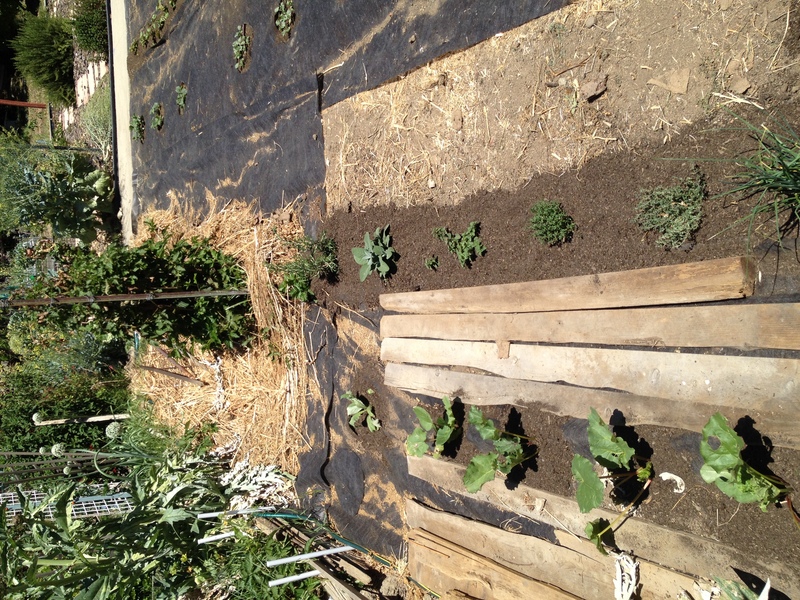 In the other “half row” we have planted Rhubarb and a variety of perennial herbs, including Rosemary, Sage, Oregano, Thyme, Chives and one Artichoke. We are planning on adding a “half row” in a combination of biennial Parsley and annual Dill. Fox Feeding the Kits! 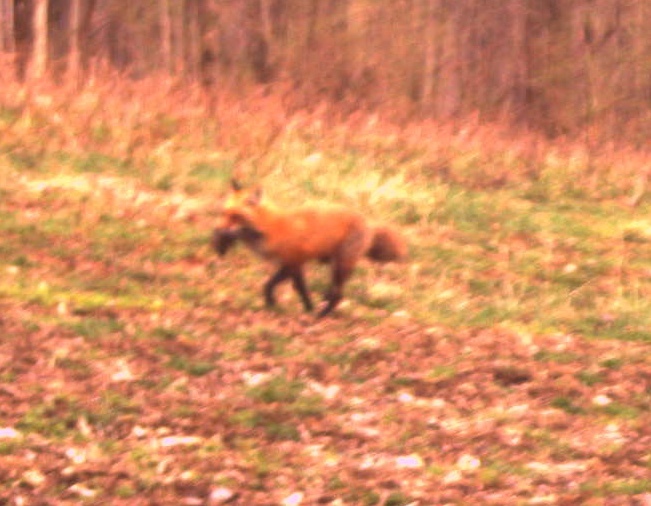 Our remote camera caught this female Red Fox returning to her den with something in her mouth. It appears that it could be a black bird. We know where she is heading because there has been an established fox den in the woods just behind the barn for several years. We witnessed last years kits playing in front of the barn on a nice sunny May morning. Kits are normally born between March and May. In previous years we have observed the remains of chickens and a wild turkey on the ground near the den. We have also observed foxes catching mice in our fields. Our neighbors got rid of their chickens last year, so that won’t be on the menu. The camera usually captures this fox going by 2-3 times a day or night. It takes a lot of food to feed a litter of 1-10 kits, which is the normal litter size. We have a competing population of Coyotes which will sometimes force foxes to move out, but so far, our Foxes are staying put. Tags: Fox Feeding the Kits! 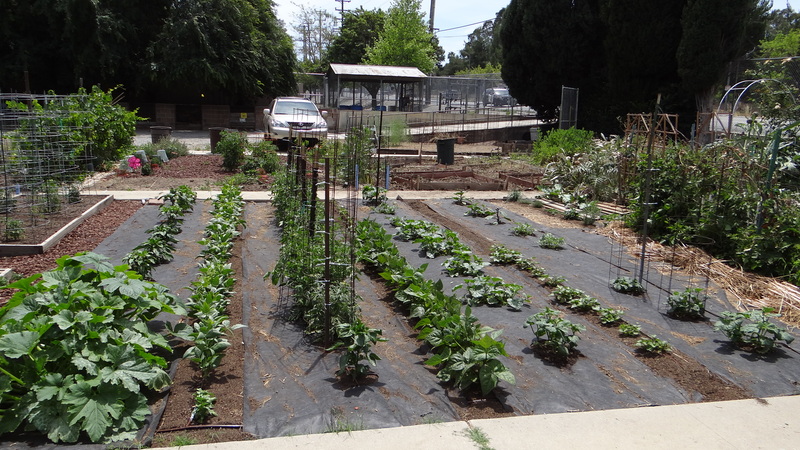 As you may recall, we are renting our garden space in a Community Garden. In doing so, we inherited a short row of thorny blackberries (maybe 12 ft. long). All we know is that they are thorny blackberries. We do not know what variety and will only find out what the berries are like by eating some of the berries this summer. This variety will produce some berries on the floricanes this summer, meaning that the canes that grew last summer will flower and produce berries this summer. All the current canes are short and very small in diameter. This indicates that they were not watered, not fertilized, or both during their last growing year. We intend to change that by making sure that they have plenty of water and fertilizer and are kept relatively weed free this summer. We have been doing this for the past month and are already seeing results. The new primocanes are growing rapidly thick, tall and lush. As these new primocanes grow, we will train them up on the trellis and prepare them for flowering and producing berries a year from now in the summer. Later in the year we will trim away the floricanes, after they have finished producing this summers’s small crop of berries. 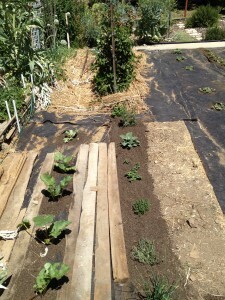 Adding Mulch to Suppress Weed Seedlings! 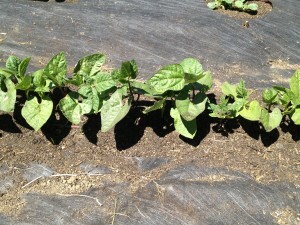 Adding Mulch to Suppress Weed Seedlings! We have been having a problem with continuous flushes of seedling weeds, including grasses, purslane, pigweed, mallow, and many others. As soon as we pull one flush, another flush germinates. At the same time, we are expecting some very hot, dry weather later in the summer, so we know we will need to conserve moisture. Our answer is to put about an inch of some fine organic mulch in a layer around the base of our seedlings and transplants. We are expecting this mulch to withhold enough light so the weed seed will not germinate. At the same time this mulch will create an insulation barrier to reduce the moisture evaporation from the soil surface surrounding our plants. 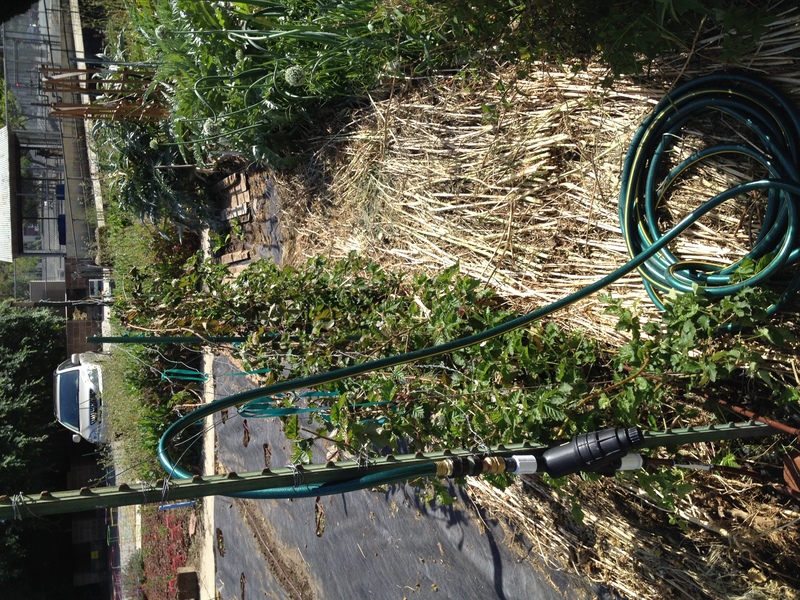 Our irrigation trickle tube is located under the mulch, so the soil should absorb the irrigation water without disturbing the mulch. A weed that will outsmart this system will be yellow or purple nutsedge, which will grow right through the organic mulch and sometimes through the landscape fabric mulch we also have in place. The best way to eliminate the nutsedge in a small garden is to just keep pulling it, so that the “nut” tuber growth is suppressed or eliminated. The fight goes on! We expect to win!! 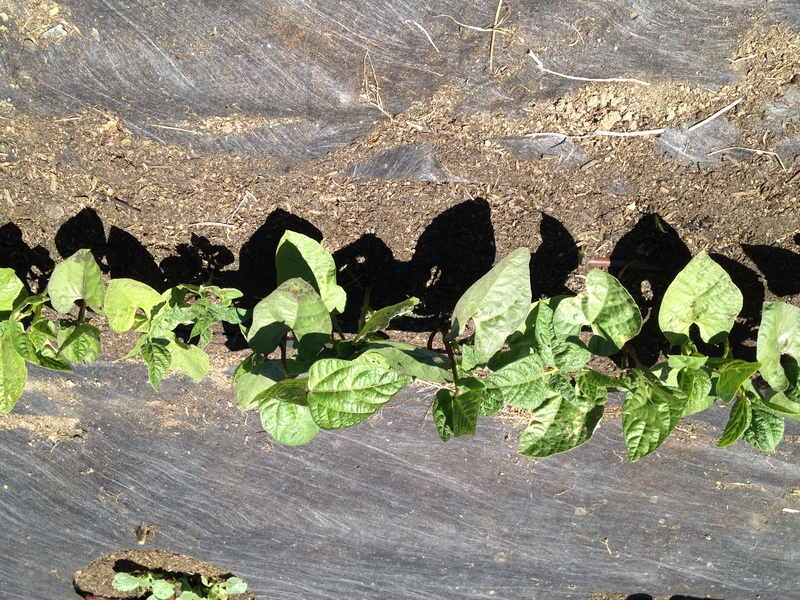 Tags: Adding Mulch to Suppress Weed Seedlings!